With warmer weather finally here to stay, picnics and outdoor get-togethers are everyone’s favorite activities! 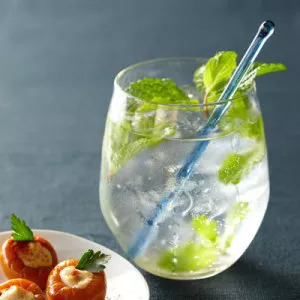 If you get roped into being the bartender this weekend, this fresh, minty cocktail is a great throw-together drink that will still impress (and refresh) a crowd. The smell of mint has been linked to eating fewer calories, so a whiff (and maybe a few sips!) could help you refrain from seconds of the potluck spread. But beware, the perfect combination of tart lime and sweet agave nectar make this drink pretty irresistible. Good thing it’s only 125 calories!